Capital Region BOCES students explored various higher education options Wednesday at the Albany Career and Technical School campus. 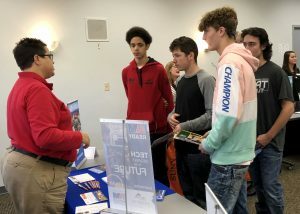 The students, who hailed from school districts as wide-reaching as Duanesburg and Cohoes, met with recruiters from nearly 20 institutions of higher learning. The college recruiters will gather again on Thursday in Schoharie to make their appeals to the Capital Region BOCES Career and Technical School students on that campus. With more than 75 percent of Career and Technical School students locally pursuing further education upon graduation and most of the students having a solid career path in mind, recruiting of BOCES students is a good option for college recruiters. Capital Region BOCES welding student Isaac Sorrell of Shenendehowa is one example of a motivated student with a solid career path in his future. “I am looking at Alfred State and Bryant and Stratton for their business programs today. I want to get a degree in business and then one day open my own welding shop,” said Sorrell. Meanwhile, senior Uniah Anos of Bethlehem has set her sight on an “arresting” future and will use her cosmetology skills to pay for it. “I am going to college for criminal justice next year. Cosmetology will allow me to work in a salon while in college and give me something to fall back on,” she said. First year heating, ventilation, air conditioning and refrigeration (HVAC/R) student Sam Boice is keeping his options open, though he knows that HVAC/R is his career of choice. “I am planning to go to a tech school or go right into the workforce to make money, but I am looking around today to see what is out there and what I can do to better myself,” said Boice, who attends Capital Region BOCES from the Voorheesville Central School District.